2013-07-07. New. Ships with Tracking Number! INTERNATIONAL WORLDWIDE Shipping available. Buy with confidence, excellent customer service! New York: Mysterious Press. Very Good. 2013. First Edition; First Printing. Softcover. An Uncorrected Proof in illustrated wrappers. Curling to the front cover. Short stories, includes a number of previously unpublished pieces as well as early screen treatments for "On the Make" and "The Kiss-Off." Pages 297-336 are two sections not included in the trade edition. ; 336 pages . 2013-07-07. Good. Ships with Tracking Number! INTERNATIONAL WORLDWIDE Shipping available. May not contain Access Codes or Supplements. May be ex-library. Shipping & Handling by region. Buy with confidence, excellent customer service! Mysterious Press. Hardcover. 0802121586 New Condition. . New. 2014-09-04. Good. Ships with Tracking Number! INTERNATIONAL WORLDWIDE Shipping available. May not contain Access Codes or Supplements. May be ex-library. Shipping & Handling by region. Buy with confidence, excellent customer service! No Exit Press. Paperback. 1843443430 Please allow 4 - 14 business days for Standard shipping, within the US. Thank you for supporting our small, family-owned business! . Fair. 2014-06-26. UK ed..
No Exit Press. Paperback. 1843443430 Please allow 4 - 14 business days for Standard shipping, within the US. Thank you for supporting our small, family-owned business! . Fine. 2014-06-26. UK ed..
No Exit Press. Paperback. 1843443430 Please allow 4 - 14 business days for Standard shipping, within the US. Thank you for supporting our small, family-owned business! . New. 2014-06-26. UK ed.. Mysterious Press. Hardcover. 0802121586 Please allow 4 - 14 business days for Standard shipping, within the US. Thank you for supporting our small, family-owned business! . New. 2013-11-04. Book Club Edition. Mysterious Press. Paperback. 0802121594 Please allow 4 - 14 business days for Standard shipping, within the US. Thank you for supporting our small, family-owned business! . New. 2014-10-14. First Trade Paper. Mysterious Press. Paperback. 0802121594 Please allow 4 - 14 business days for Standard shipping, within the US. Thank you for supporting our small, family-owned business! . Fine. 2014-10-14. First Trade Paper. Mysterious Press. Hardcover. 0802121586 Like New Condition. . Fine. Mysterious Press. Hardcover. 0802121586 Please allow 4 - 14 business days for Standard shipping, within the US. Thank you for supporting our small, family-owned business! . Fine. 2013-11-04. Book Club Edition. Mysterious Press. Hardcover. 0802121586 Please allow 4 - 14 business days for Standard shipping, within the US. Thank you for supporting our small, family-owned business! . Fair. 2013-11-04. Book Club Edition. Mysterious Press. Paperback. 0802121594 Please allow 4 - 14 business days for Standard shipping, within the US. Thank you for supporting our small, family-owned business! . Fair. 2014-10-14. First Trade Paper. Mysterious Press. Hardcover. 0802121586 *BRAND NEW* Ships Same Day or Next! . New. Mysterious Press. Hardcover. 0802121586 *LIKE NEW* Ships Same Day or Next! . Fine. No Exit Press. PAPERBACK. 1843443430 Brand New ,Original Book , Direct from Source , Express 5-8 Business days worldwide Delivery. . New. Mysterious Press. Used - Like New. 2013. Hardcover. Fine. Dust Jacket is Fine. Mysterious Press. Used - Very Good. 2013. Hardcover. Very Good. New York: The Mysterious Press, 2013. Book Club Edition . Hardcover. Near Fine/Near Fine. 8vo - over 7¾ - 9¾" tall. This book is clean, tight, square with sharp corners and unmarked in an equally fine dust jacket. It has 291, bright, clear pages bound in black paper covered boards with bright gold titles on the spine. There's nothing much wrong with this book, but it has been read. Mysterious Press. Hardcover. 0802121586 . New. 2014. Mysterious Press, 2013. Hardcover. New/new. New in dust jacket. Hardcover. 291 pp. Introduction by Richard Layman. 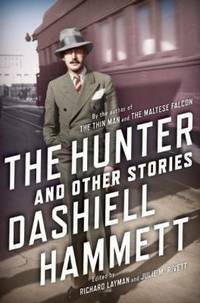 21 works from America's hard-boiled legend Dashiell Hammett. This collection includes a dozen stories nerev before published, gleaned from Hammett's archives, revives 7 seldom seen short-fiction narratives, unveils three screen treatments unearthed from film industry files and concludes with an unfinished Sam Spade adventure discovered in a private collection. Mysterious Press, 2013. Hardcover. Near Fine. Not Ex-Library Copy. Hardcover Edition With Dustjacket.Text Unmarked.Binding Is Solid.Not Ex-Library Copy.D.J. Not Clipped.No Remainder Mark. First Edition, First Printing. Hard Cover. The Mysterious Press. Edited by Richard Layman and Julie M. Rivett. Unless Listed in this decription, VG or Better. Mysterious Press, 2013. Book. Near Fine. Hardcover. minimal wear, clean and tight, no remainder mark. No Exit Press. Used - Good. Ships from the UK. Former Library book. Shows some signs of wear, and may have some markings on the inside. 100% Money Back Guarantee. Your purchase also supports literacy charities. Mysterious Press. PAPERBACK. 0802121594 *BRAND NEW* Ships Same Day or Next! . New. Mysterious Press. PAPERBACK. 0802121594 *LIKE NEW* Ships Same Day or Next! . Fine. New York, New York, U.S.A.: The Mysterious Press, 2013. First printing (no statement of later print). Light soil to outer edges and light creasing from page handling. DJ has edge/rub wear and light creasing. Actual book for sale pictured. 15.9 x 23.6 x 2.6cm, wt700g. First Edition. Hard Cover. VG/VG. 8vo - over 7¾" - 9¾" tall. Mysterious Press. Used - Like New. 2014. First Trade Paper Edition. Paperback. Fine. Mysterious Press. Used - Very Good. Former Library book. Great condition for a used book! Minimal wear. Grove/Atlantic, Incorporated, 2013. Hardcover. Acceptable. Disclaimer:A readable copy. All pages are intact, and the cover is intact. Pages can include considerable notes-in pen or highlighter-but the notes cannot obscure the text. At ThriftBooks, our motto is: Read More, Spend Less.Dust jacket quality is not guaranteed. Grove/Atlantic, Incorporated, 2013. Hardcover. Good. Disclaimer:A copy that has been read, but remains in clean condition. All pages are intact, and the cover is intact. The spine may show signs of wear. Pages can include limited notes and highlighting, and the copy can include previous owner inscriptions. At ThriftBooks, our motto is: Read More, Spend Less.Dust jacket quality is not guaranteed. Grove/Atlantic, Incorporated, 2013. Hardcover. Good. Disclaimer:A copy that has been read, but remains in clean condition. All pages are intact, and the cover is intact. The spine may show signs of wear. Pages can include limited notes and highlighting, and the copy can include previous owner inscriptions. The dust jacket is missing. At ThriftBooks, our motto is: Read More, Spend Less.